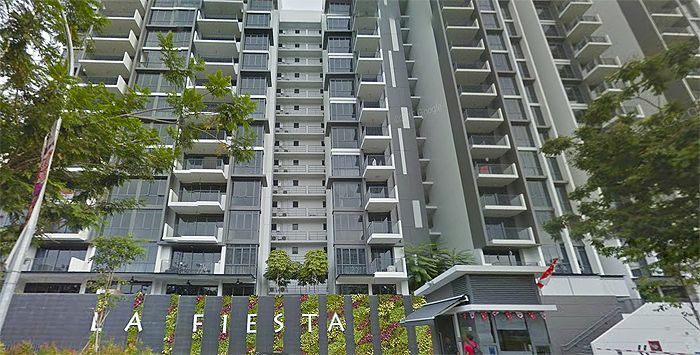 Owners at the newly completed La Fiesta – located in Sengkang Central have recently voiced their displeasure over property developers building huge oversized air-conditioner ledges. It is considered to be a loophole by home owners as these spaces are not counted or consider as part of the gross floor area of the apartment. Thus, it allows property developers to build them and charge buyers for that space. According to statistics, owners of properties in Singapore have paid a whopping estimate of S$780 million for these air-con ledges. Authorities have been prompted by industry experts to remove this exemption of the gross floor area – just as they have done for bay windows and planter boxes 9 years ago, which was commonly seen as an exploit for property developers to make more profits. The gross floor area (or GFA) is referring to the maximum cap amount of livable space that a property developer can build on the subject plot of land. As of current, air-con ledges are typically up to 1-metre wide and does not count into the total GFA of a condo development. Instead, they are considered as strata area that property developers can charge prospective buyers for as part of their properties. It was reported that approximately 200 property owners at La Fiesta are now furious over these massive air-con ledges in their units. Based on their calculation, around 80% of the homes at 810-unit condo have air-con ledges which are 4 meters or longer, which takes up more than 5% of their apartment’s floor area. Some air-con ledges even measured up to 9-metre long for a 4-bedroom apartment (127 square metre). On the contrary, HDB flats, 4 or 5-room , have such ledges at about 3 square metres, which can easily fit 2 air-con compressor units. This works out to be only around 2.7% to 3% of the total floor space. Having paid an average price of around S$1,174 per square foot, residents at La Fiesta have paid an estimate of S$18 million for these unused spaces at their air-conditoner ledges. An owner at La Fiesta is hoping that home buyers will take a cautious approach and be wary of paying for oversized air-con ledges and hope that the authorities can close this loophole. According to developer of La Fiesta, EL Development – who is also the developer for current launches such as the new Parc Riviera and Symphony Suites, they have no obligations to make any changes to the blueprint. It was added by a spokesman from EL Development that the sizes and extents of the air-con ledges were presented and acknowledged by the buyers before the option-to-purchase (OTP) was granted and issued. Also, it was claimed that the air-con ledges were designed in a way to allow more room for electricians to work at the air-con ledges and to fit all sizes of compressor units. When being questioned by the press, the Urban Redevelopment Authority (URA) mentioned that there aren’t any guidelines present for building air-con ledges. Similar responses were received from the Real Estate Developers’ Association of Singapore (REDAS) and also the Singapore Institute of Architects. Since 2012, it has been a requirement for property developers to provide and submit a drawn-to-scale floor plan of the apartment and also a comprehensive breakdown presenting various spaces in the unit. However, property experts has urged that such air-con ledges should be classified as non-strata areas instead, thus fewer property buyers will feel cheated if they won’t have to pay for such spaces.